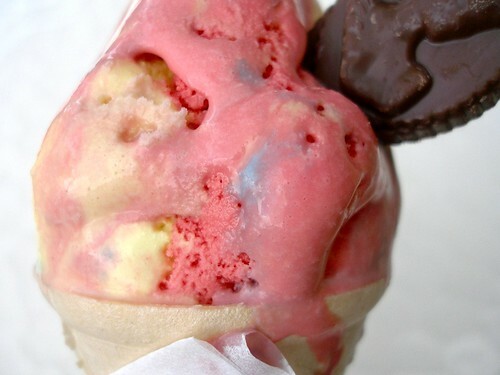 super kid ice cream, originally uploaded by the workroom. You going to detect an ongoing theme this week. This Sunday August 17th is the Kids Trunk Show at the workroom. Plus, there are other crafty activities in Parkdale that day, like the Good Catch Double Dutch Craft Show. I’m going to be doing a couple profiles this week of some of the participants, so there will be lots of posts to keep you entertained! It’s my day off today and while I was running some errands in Bloor West Village, I stopped into the Laura Secord to get a cone of Super Kid. I’m not sure exactly what the flavour is meant to be, but I totally love it. I might as well confess, my favourite Baskin Robbins flavour is Bubble Gum and my favourite popsicle is the Rocket Pop. I guess I’m about 12 years old. Check out this darling popsicle creation. Too cute!